It was a bitzer. Sort of medium size, black all over, nondescript. I saw it dart across a triangle of grass to intercept us on a corner. It looked harmless enough until it stopped, retreated for a moment, then came forward on its belly as if to say, you can't see me. It backed off a couple more times, each time returning and closing the gap. Two boys raced after it. We were going uphill and were never going to outrun it so I tried a different approach - jamming on the brakes in the hope the dog would lose interest once we stopped. Instead, it ducked around the back of the tandem and there was a loud yelp, which didn't come from the dog. The yelp was followed by a stream of abuse directed at the dog, the boys and the world in general. Dog attack on the outskirts of Ballybofey, north of Donegal. Judy was so outraged she could not find the right word. "Has it been ... (vaccinated) .. has it, does it have diseases, does it have RABIES?" "Of course he doesn't have rabies," sneered the older of the two boys and ducked away out of more trouble, leaving his kid bro to deal with the Stoker. "He always bites cyclists," said the younger, more naive of the pair. I tried to ascertain the extent of the injury. I couldn't see a stray foot lying on the roadside, nor was the dog gnawing on anything from its vantage point some distance away. There wasn't even any blood spatter and both legs seemed to be functioning normally as Judy stormed off in an unsuccessful attempt to find the owner. 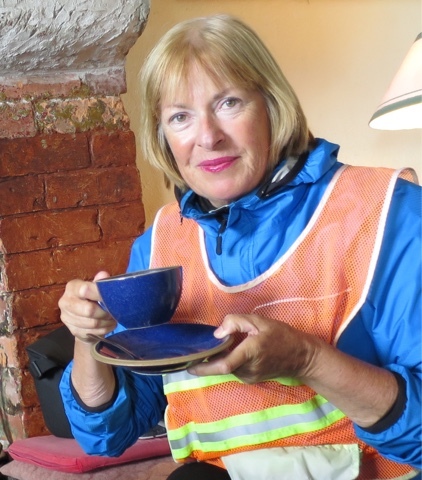 Once we were back at our hostel, Judy disappeared into the bathroom with the first aid kit and I searched the Internet. 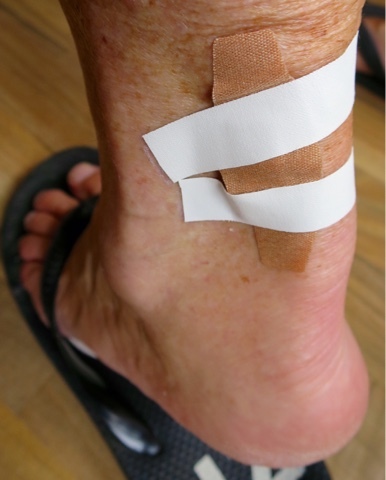 She emerged with a plaster above an ankle and I was able to tell her there had not been a case of rabies in Ireland since the 19th century. The next day we had to cycle down the same road. 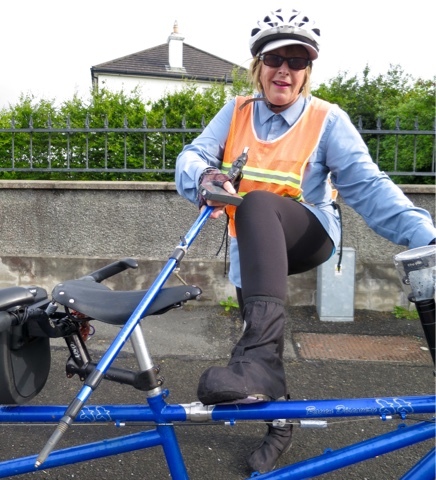 Judy went prepared - wearing her overshoes to protect her ankles, our bike stand in one hand and the dog dazer in the other. Naturally the dog was nowhere to be seen. By the next morning, the patient showed no rabies-related symptoms - no numbness at the site of the injury, no anxiety, no confusion, no nausea. I turned on a tap and she showed no fear of water. In fact, she seemed in excellent spirits. "You know," I said,"you could consider downgrading this from a dog bite to getting a nip on the ankle." "Oh yes, I've already thought of that. Quite a laugh really, now that I don't have lockjaw or whatever." 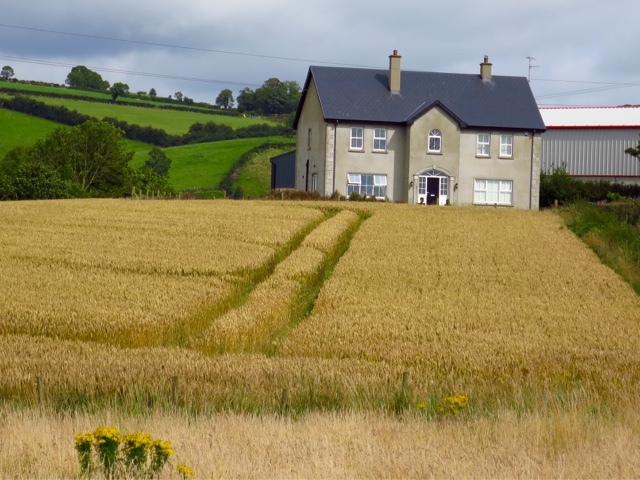 The wind that blows the barley - east of Raphoe, Co. Donegal. 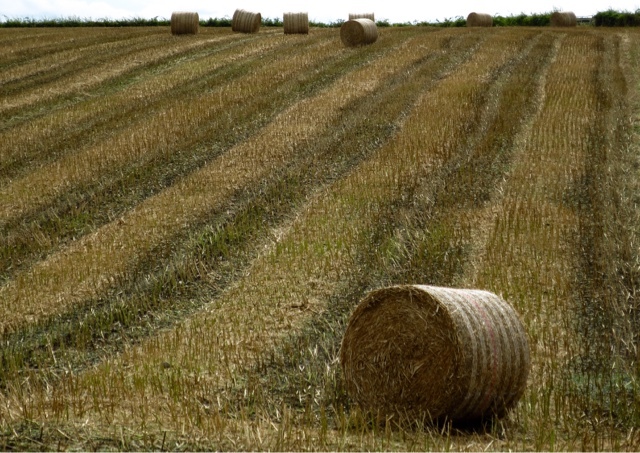 Hay making time - east of Raphoe, Co. Donegal. 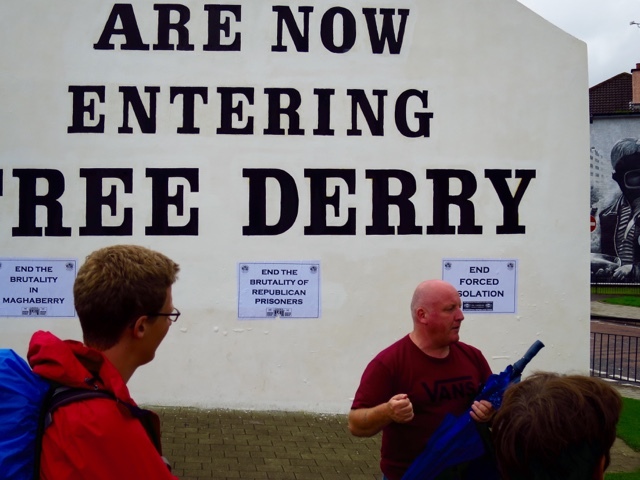 Our guide on one of the almost obligatory walking tours of Derry/Londonderry was Paul Doherty. His father, Patrick, was shot dead by a British soldier during Bloody Sunday, 1972. 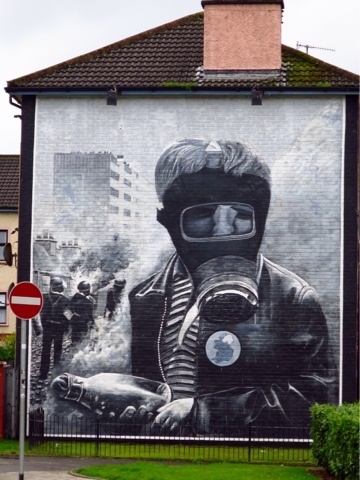 Mural depicting a scene from the Battle of the Bogside, 1969. A boy wearing a gas mask and clutching a petrol bomb. 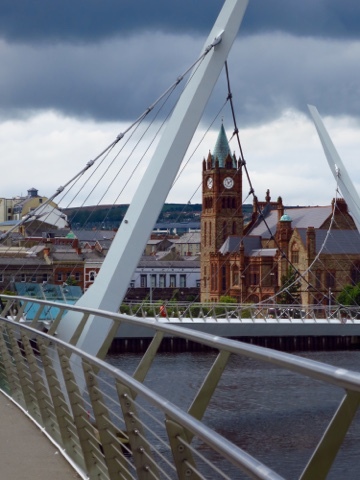 The Peace Bridge in Derry/Londonderry built to try to unite the east and west of the city. About to begin a delicious descent off Binevenagh, towards Magilligan Point. 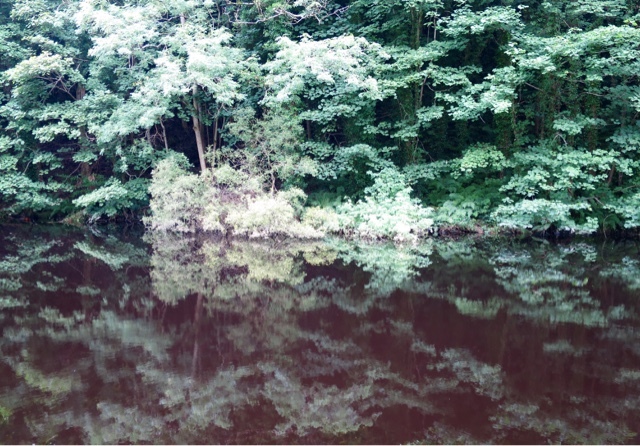 Reflections - after a wrong turn on a cycle path in Downhill. 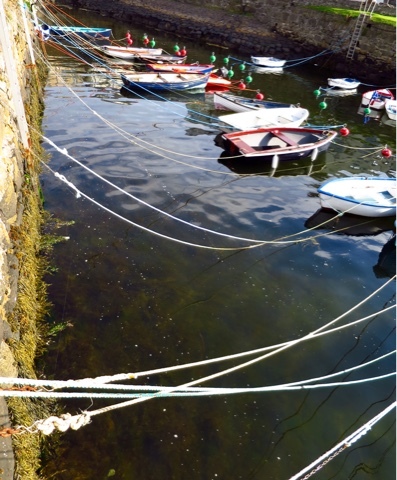 Harbour view, Portrush, Co. Antrim. 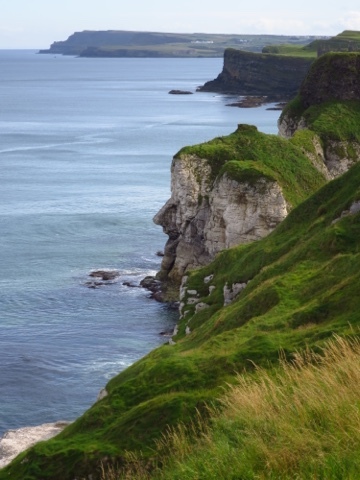 Causeway Coastal Route - Co. Antrim. 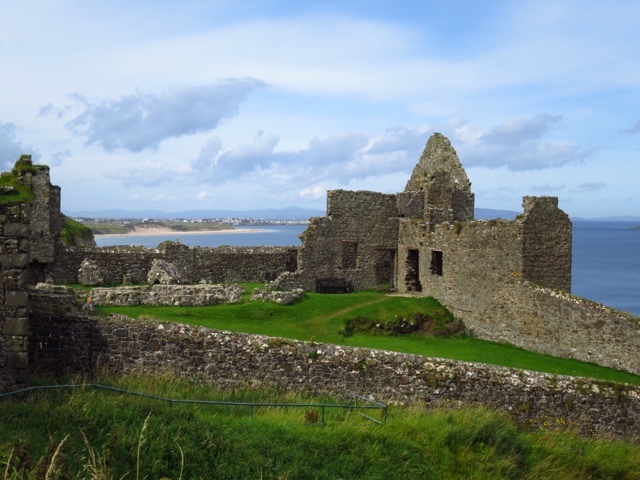 A gem of a castle - Dunluce, Co. Antrim. 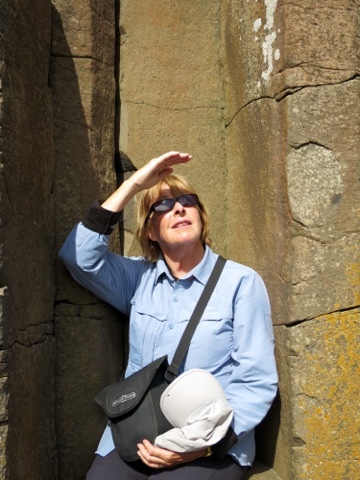 Judy takes a seat among the polygonal basalt columns of the Giant's Causeway, Co. Antrim. How many people in a selfie? 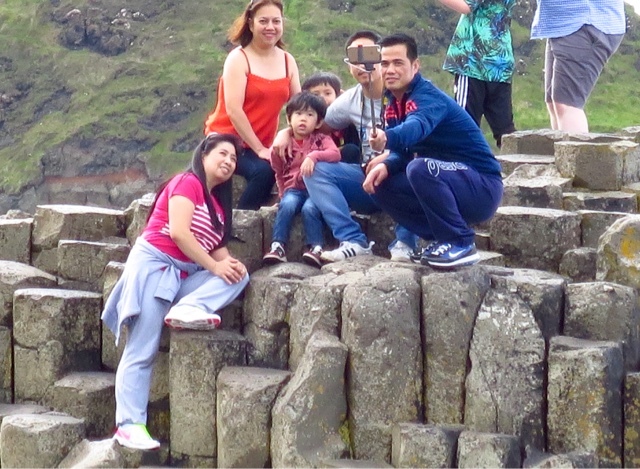 The Giant's Causeway, Co. Antrim. 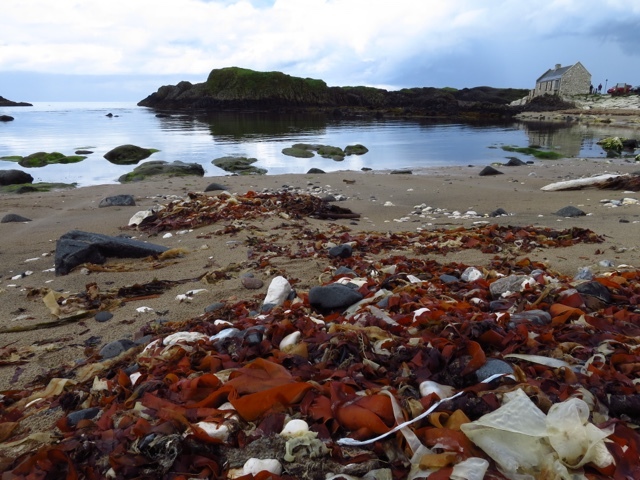 Seaweed - Ballintoy, Co. Antrim. Fissure - Ballintoy, Co. Antrim. 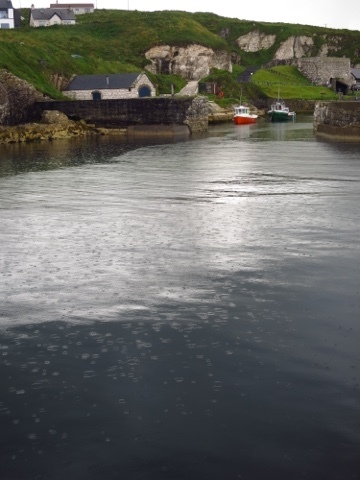 Rain shower - Ballintoy Harbour, Co. Antrim. When the weather has brightened, the riding has been excellent. We can't get over the lack of traffic on many country roads. 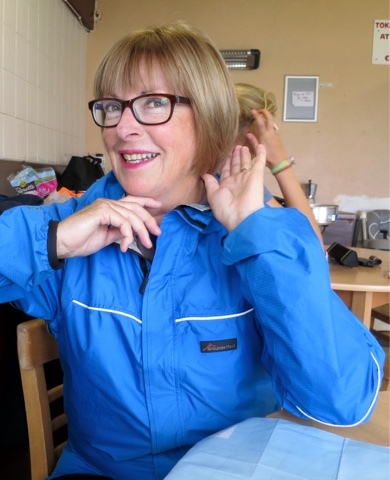 We have been rained on, savaged by midges and Judy was pooped on by a bird. So it is hardly surprising that when we discovered there was a self contained room for €30 in a hostel in Kiltyclogher, Co. Leitrim, we snapped it up. First for one night, now a second and a third. Anything to escape the Great Outdoors. 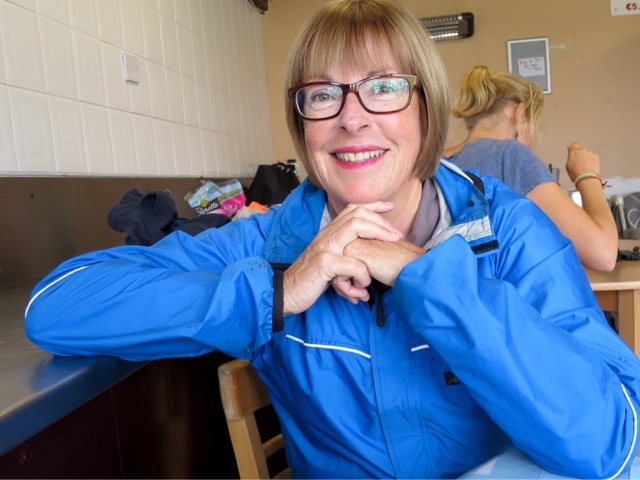 "It's not as bad as Shackleton and those people," said Judy referring to the book she is reading, South: The story of Shackleton's 1914-1917 expedition. "However, I'm not in the Antarctic. I'm in Ireland." Sometimes we have to remind ourselves about the joys of cycling. 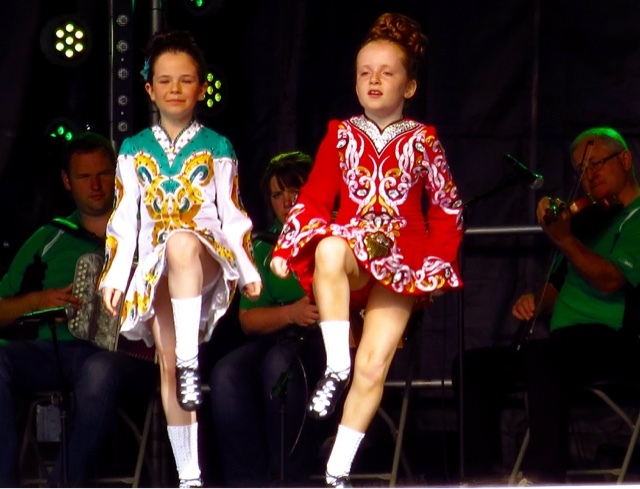 Dancing their hearts out at Fleadh Cheoil, Sligo, 2015. On the plus side, we have just had a wonderful four days in Sligo town, at the Fleadh Cheoil or traditional Irish music festival. The city was crammed with tens of thousands of visitors - sports grounds were turned into temporary campgrounds and buskers struggled to be heard over each other. 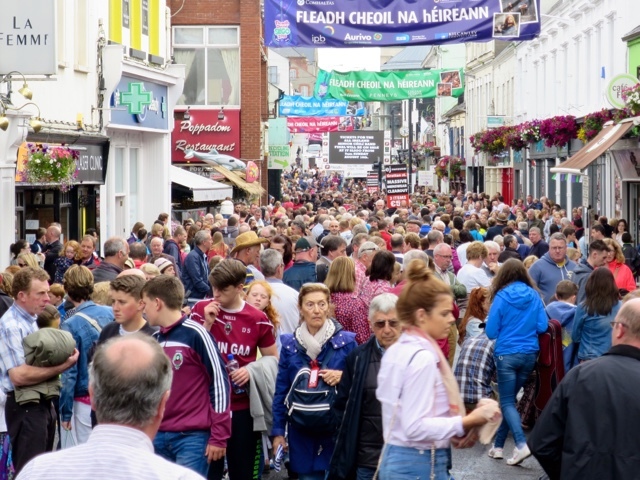 Crowds, music, pubs - the Fleadh is a hugely popular event. 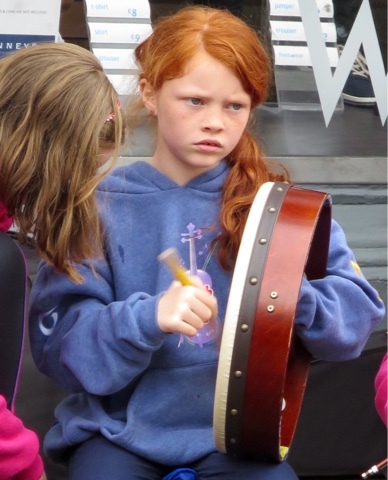 We came across the Fleadh quite by chance, learning about it the day we arrived. The variety of gigs - formal and informal - was astounding, though we have to admit that by the end we had heard enough of those jigitty jig Irish jigs and reels. To our untrained ears, a lot of them sounded the same. 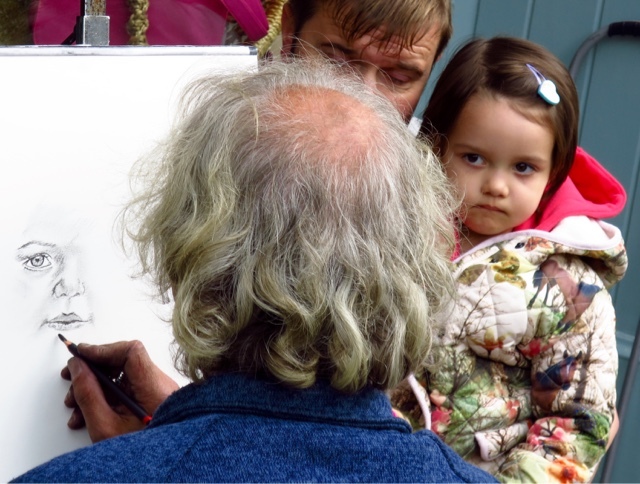 Buskers of all ages were out on the street. This girl playing her bodhràn seemed more interested in the passersby than the music being played by the rest of her group. As if to prove the point, our favourite busker - and everyone else's - was a gentle faced young man of about 18 who was playing a country/Americana hit, Wagon Wheel, on high rotation. First made famous by Old Crow Medicine Show, the beat was infectious - some people dancing and even the most restrained of us unable to resist tapping a foot. We sensed every mother in the crowd would have liked to take him home, give him a good feed and run him past their daughters. For anyone interested in Irish music, here are some of the people we have enjoyed lately. 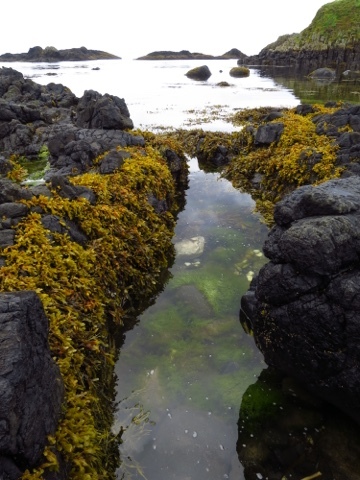 Song: Liscannor Bay. We saw the group perform in Doolin, Co. Clare. 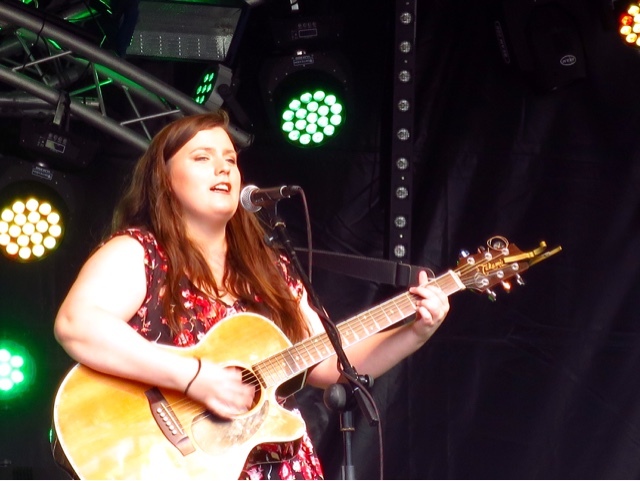 Emma Ni Fhioruisce performing at this year's Fleadh. A quiet voice asked us to pull over and the woman in the picture announced to us: "Maria says hello from Germany". Sabine (pictured) is the best friend of a Maria whom we know from her travels in New Zealand. You can imagine our surprise. 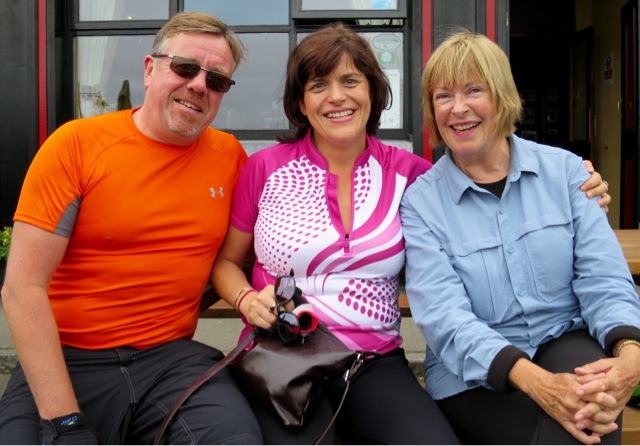 Apparently Maria had mentioned to Sabine that while she was on a cycling holiday in Ireland with her friend Uwe (left) she might just spot us on our tandem. Sometimes you just click. 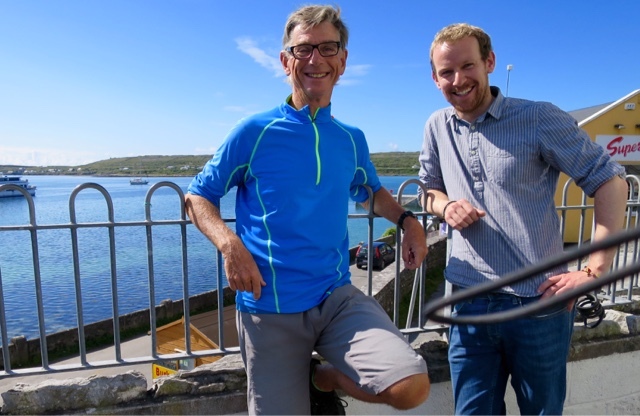 We met Dublin teachers Liam and Clare while having coffee and in the space of a few minutes ticked off work, the benefits of travel and cycling and the quest for a balanced lifestyle. They were delightful, and we would have loved to spend more time with them. 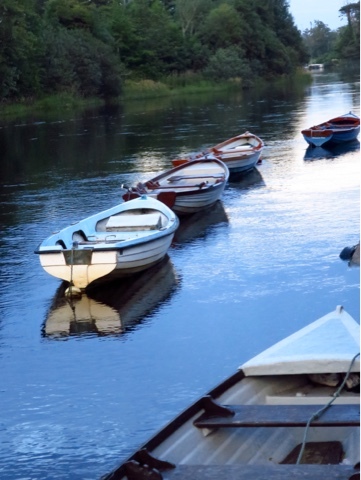 At rest on Sligo's Garavogue River. Judy is getting a haircut this morning - right now as I write - and I am worried. She will return either elated and full of the joys of living, or seething with suppressed anger at the incompetence of hairdressers. Either way, the first few seconds of her return are difficult for me. It is no good simply saying,"Gee, back already, hair looks good. How about lunch?" I have to read the situation instantly - joy or seething anger - and respond appropriately. And then followup with intelligent comment. "She's done a really nice job hasn't she? Really like the way those straggly bits are tucked under. How did she do that?" Only to be met with cold fury aimed at the hairdresser and at me, for my lack of awareness. Before - at least a couple of weeks earlier. I do have some sympathy for the Stoker. Judy tolerates a lot on the back of the tandem. Most women - and I suspect many men - would not put up with the constant exposure to the elements, the discomforts of a saddle and month after month of life in a tent. But these are as they say, first world problems of our own making. Perhaps in exchange for these hardships, Judy insists on just one thing - trying to look after her hair. But it's not easy on the road where the comfortable familiarity - even friendship - with a regular hairdresser is gone. So Judy does the next best thing. When we get to a likely town - usually a bigger one - she asks around for a good hairdresser. However, one person's good hairdresser is not necessarily Judy's good hairdresser. In France, there was the woman who did the cut in about five minutes, much of it with a razor. The worst cut was Croatia - she came out with a pudding bowl. The worst colour was in Chinatown, Bangkok, where even with a phrase book in hand dark blonde came out as black. The best cut - just for the record- was by a hairdresser who came in on her day off in Sausalito, north of Los Angeles. Each of these haircuts (and don't forget the colouring) is indelibly imprinted on Judy's memory. No wonder she set off with trepidation a couple of hours ago and I'm worrying. I have been rescued from a potential blunder by two New Yorkers. She is loud of mouth and sharp of lip. He is dark, laconic and might be an actor in a TV crime series. She is bemoaning the poor facilities in the campground laundry. Judy arrives while I am being ear bashed by this pair. I can't get a word in, but it gives me time to assess Judy. I can see nothing obviously wrong with the cut - no straggly bits, no pudding bowl, neat, tidy, I think it might be ok. Don't know about the colour, that's the impossible bit for me to judge. Hello, is that a smile I see. Yes, it is. It definitely is. Go on, I dare myself. Take a chance. Footnote: As Captain of the Beast of Burden I have to maintain a certain level of grooming myself, but I find it simpler than the Stoker. I bring my own personal hairdresser with me. We choose a calm, windless day when we have plenty of time and she makes a fine job of it. The only drawback are the blunt nail scissors which regularly jam and pull the hair out in tufts rather than cutting it. Painful, but a small price to pay. I may ask my personal groomer if she would consider upgrading her skills to include hair colouring - more and more gray is creeping in and we both have standards to maintain. And see the sun go down on Galway Bay." It was a song popularised by Bing Crosby, and buried deep in my childhood memories. Now Judy and I have indeed, seen the sun go down over Galway Bay. It took a bit to make it happen - stuck for two days in atrocious weather at Doolin, waiting for the ferries to resume operating. 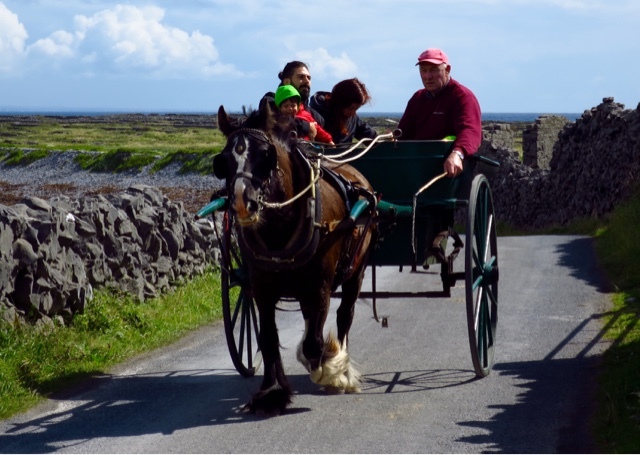 They run to the Aran Islands which guard the entrance to Galway. Our ferry felt more fishing boat than ferry - a nuggety, tough little vessel which even in the calming seas rolled beam on to what was left of the storm. Down below, the cabin was a steel box with hard seats and tiny portholes. 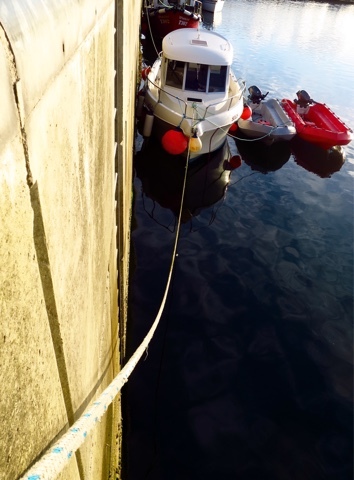 At any moment we expected the crew to open a hatch and dump a load of fresh fish on top of us. We soon decided we were better off on deck despite the wind, cold and occasional rain. 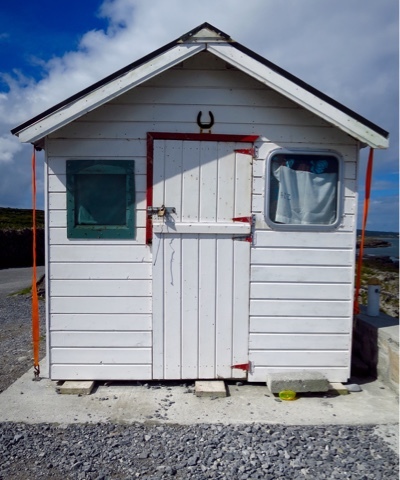 We were disgorged onto the wharf at Kilronan - the biggest settlement on the biggest Island, Inishmore - and found ourselves in one of those places where tourism is threatening to destroy the very things that bring people there - the peace, tranquility and beauty. 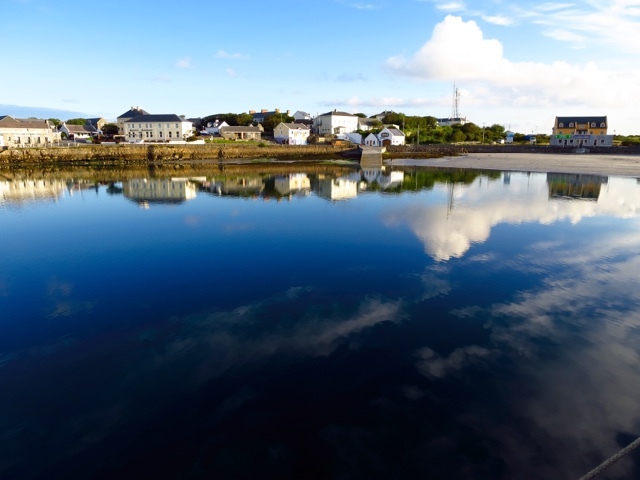 Kilronan - early morning before the day trippers arrive. 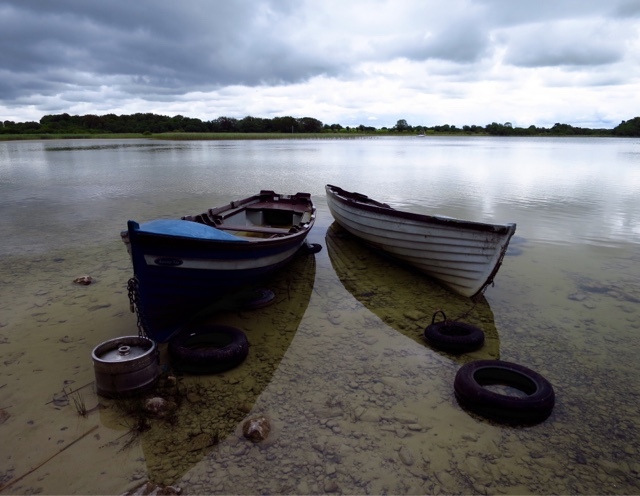 We stayed two nights and discovered that somehow Kilronan was retaining much of its charm, despite the heaving mass of humanity on the wharf, the bike hire shops and the bus tours. There was a solidness about the place, a sense of permanence as though it might outlive the hordes taking selfies. 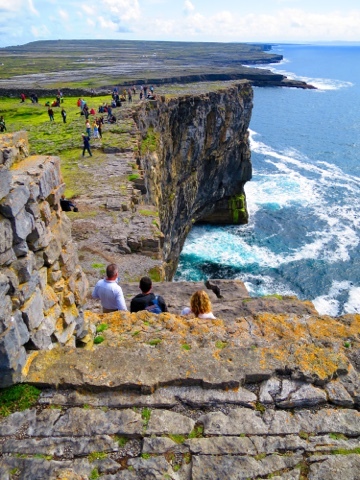 Dun Aengus Fort is built on 90 metre cliffs battered by the Atlantic Ocean. 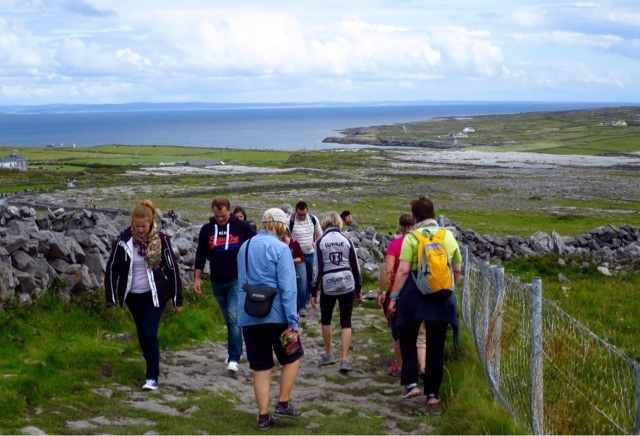 We left our luggage at our hostel and cycled out to the island's biggest tourist attraction - the prehistoric stone fort of Dun Aengus, perched on a 90 metre cliff overlooking the Atlantic. Tour buses fought for parking, the bike park was full and the trinket shops were doing good business. The fort itself was overrun by modern invaders - us tourists. Despite the spectacular setting we were underwhelmed. There were just too many people. It was for me at least, impossible to reflect on what it must have been like to live there more than 3,000 years ago. We join all the other tourists at Dun Aengus, but our very presence is destroying the tranquility of this ancient hilltop fort. 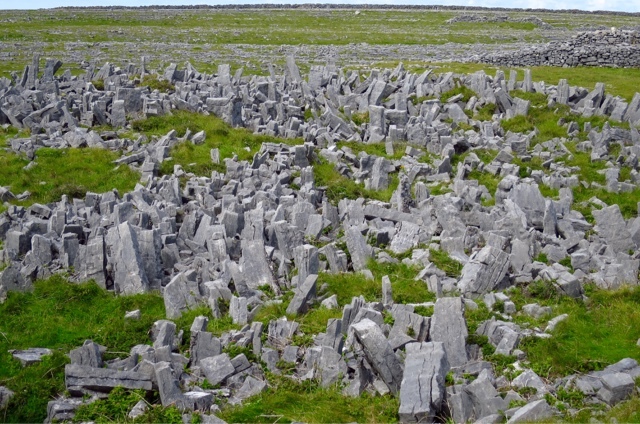 Like razor teeth, these upright stones are known as chevaux-de-frise and were designed to impede attackers at Dun Aengus. But all was not lost. As we have discovered often in the past, most tourists are on whirlwind trips ticking off places as they go. 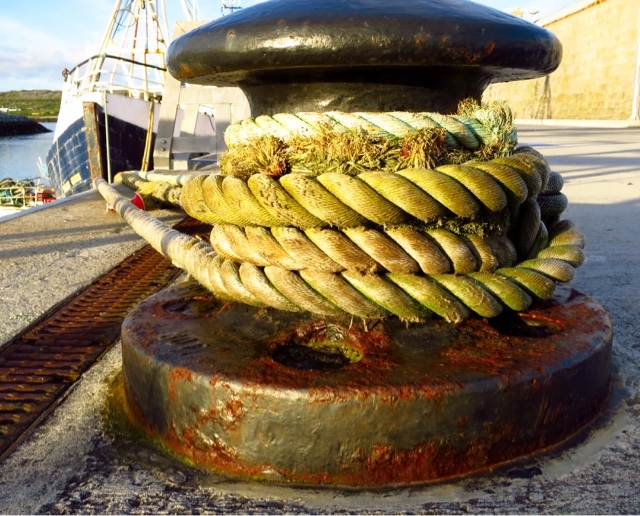 Many "do" Inishmore in a few hours - arriving on a ferry in late morning and leaving that afternoon. Cycling across the island we came across tourism ventures trying to make a go of it. This sweet shop was in an odd location - a seal colony - and looked like it had gone out of business. A tiny cafe selling hot drinks might have done better given the often bad weather. Jaunting cars - horse and cart - are popular for those tourists not inclined to cycle or take a bus tour. With the luxury of time, we visited a couple of the less popular sites and it was there we found what we wanted. 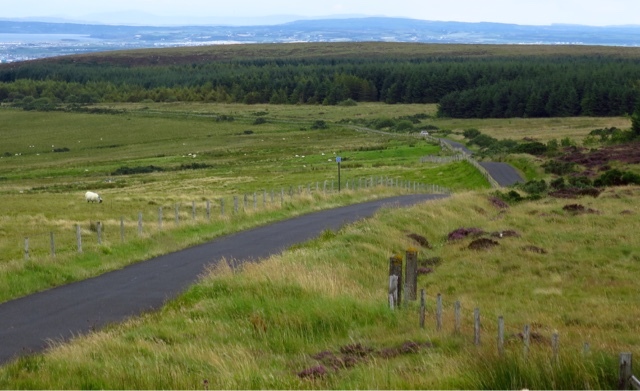 One was Dun Duchathair, the Black Fort, in a location that can only be reached by walking or cycling over a road that deteriorates the further it goes. There was hardly a soul there, and we wandered happily with just the sounds of the wind, the sea surge breaking on the cliffs below and the call of seabirds. 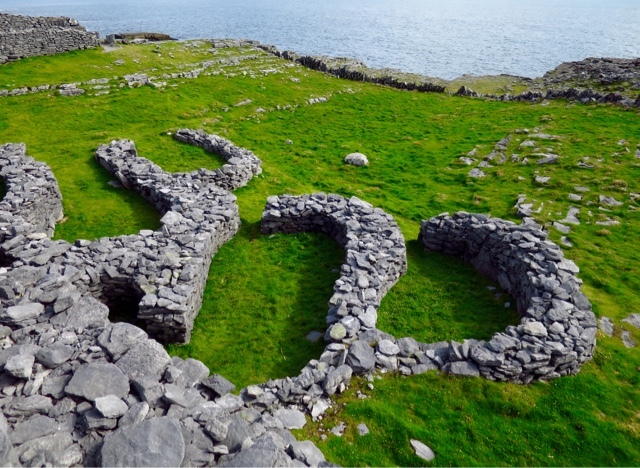 The equally spectacular ruins at Dun Duchathair, with hardly anyone else. Different, but every bit as well worth visiting, was Teampall Bheanain, or St Benan's Church. Built in the 11th century, it is tiny - just five metres long. 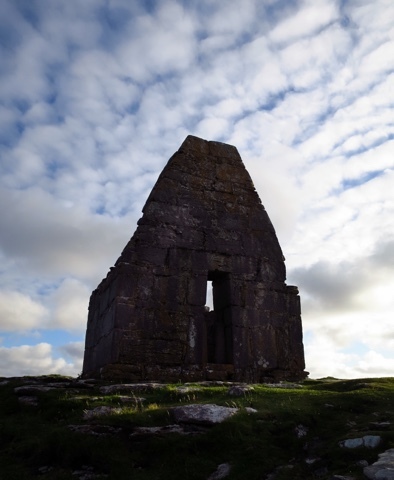 It sits on a hilltop overlooking Kilronan and much of the island. Its roof has long gone, but it is still resisting the ages. We visited in early evening and yes, we watched the sun go down over Galway Bay. Teampall Bheanain in the early evening. Built of stone slabs, it is just five metres long. Some claim it is the smallest church in Western Europe. With Kevin Christie who manages the Kilronan Hostel. He has his own concerns that too many tourists take too many short visits to Inishmore, and miss opportunities to really appreciate it. Incidentally, Kevin is one of the founding members of KKK - Kool Kerry Krew (nothing to do with that other KKK). 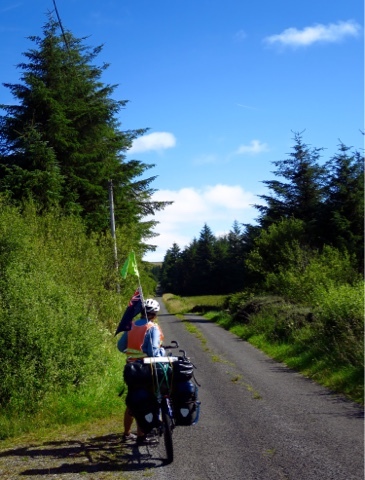 Each year he and a group of friends undertake a cycling tour in Ireland. We met him and the rest of the KKK while we were all camping at Dingle.